The moon will be "only" 220,000 miles away from Earth (about 31,000 miles closer than it is at the longest point of its oblong orbit around us). So it will appear about 14 percent larger than usual. AND there will be a total lunar eclipse, when the moon will pass behind us into Earth's shadow. 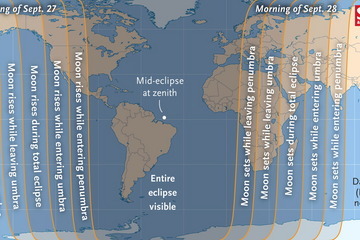 So the moon will be dark, except for a red tint. If you don't get to see the supermoon eclipse this time, the next one will be in 2033. If I don't get to see the supermoon eclipse this time, it will be because of cloudy skies. I think it will be worth driving east out of our usual September cloud cover just to see this! Or you can watch it live on some streaming deal at NASA (but when I tried to get to that URL I found something else, so I'm not putting the link here). As I posted in my training blog, I'm going to start the 8-week challenge again, starting tomorrow, Monday, September 21. I'll write something about each week's challenge at the beginning of each week, too. So, tomorrow, the 21st, I'll note that I'm beginning the first week, and what that entails. Also, I'll write something sometime during each week about how I'm doing with the challenge so far. I was going to post all this stuff here as well as on the training blog, but I've decided not to. Week 1: Start Keeping a Food Journal. Each day, write down what time you wake up, the time you eat, what you eat, how much you exercise, how much water you drink and what time you go to bed. For those of you who work, it may be easier to keep track of this on a little notebook kept in your purse. Earn 1 point for each day that you complete a full journal. Week 2: Continue Week 1 habits. Cut out all sugar, junk food, soda pop, and fast food! This is going to be the hardest week for all of us. My friend Joyce would say this is when your fight or flight mentality is going to come out! Just start getting prepared NOW and get all the sugar, junk food, and pop out of the house. This is as much a mental challenge as a physical challenge. Also, you can allow yourself natural sugars like fructose just make sure that you pair them with a protein to maximize energy. So, if you eat an apple pair it with some nuts or a string cheese. Also, you can have the sugar that is in a small amount of a sauce like a dressing or BBQ sauce. Week 3: Continue Week 2 habits. Eat 2 servings of fruit and 3 servings of vegetables per day. Week 4: Continue Week 3 habits. Exercise a minimum of 30 minutes per day, 5 days per week. This can be as simple as brisk walking. The goal is to raise your heartbeat. If you're feeling a good cardio workout, working up a sweat, increased heart rate, it counts. Also, the more that you can vary your exercise routine the better. So, do cardio one day and weights another. Try different forms of exercise (i.e. an elliptical one day and swimming another). Try to establish a routine. If you must, you can split this into three 10 minute segments for a total of 30 minutes. ****For the remaining weeks, we will need to eat low glycemic, sticking to the recommended foods list and we will earn a point for each day that you do so. Week 5: Continue Week 4 habits. Drink at least 64 ounces of water per day, but current studies suggest that drinking at least half of your body weight in ounces per day is a better choice. So, if you weighed 200 pounds you would need 100 ounces of water per day. Week 6: Continue Week 5 habits. Take supplements each day as recommended on the packaging. This can be a simple vitamin or something more as you need it. Week 7: Continue Week 6 habits. Start your day with "Quiet Time" every day. This should be at least 30 minutes of meditation, but can include your own scripture study or other meditation that you currently do. Week 8: Continue Week 7 habits. Sleep at least 7 hours each night. I was walking through the grocery store exactly one week after having my left shoulder fixed, when a guy came up to me and said, "Rotator cuff?" He's going to get the same surgery in a couple of weeks, he said, and added, "I've talked to so many people about this, and these people have had knee replacements, you name it, all kinds of things, and they say this is the toughest one. They say it's like giving birth---not that I would know about that." I've found that I have to stay on top of the pain so it doesn't wake me up in the middle of the night (or make me grumpy during the day). Having weaned myself of the nasty narcotic pain reliever they had me taking after my three-day shot of local nerve block ran out, I'm using aspirin and acetaminophen every few hours. I saw an orthopedist today, eleven days after the surgery. He checked the puncture wounds in my shoulder (healing nicely) and gave me advice about how to treat them (no more antibiotic ointment and no more dressings), and told me to keep taking it easy on my arm. He told me that different orthopedic surgeons give different advice about how to recover. He said the one who did my surgery has a somewhat conservative approach: Don't start doing any exercises for at least eight weeks. Why? Because he believes the possible risk to the surgical repair is too great with exercising too soon. Some surgeons have you raising your hand above your head and so on; my surgeon wants me to wear my sling faithfully and to do only those little pendulum exercises three times a day until I see him in another three weeks. "He says the purpose of the surgery is to fix the joint and relieve the pain; you may have stiffness from not exercising sooner, but you don't risk tearing out the tendon attachments." And I say, "Hurray for that opinion." I totally agree. Stiffness can be dealt with later. In fact, it seems to me that with other joint and muscle injuries I've had in the past, when I worried about getting stiff and exercised those muscles too soon I just incurred further damage; when I was forced to lay off the exercise for awhile, I started recovering much sooner. So I'm going to be watching the men's semifinals whenever they come on, binge-watching "Sherlock" for as long as those old episodes keep being replayed, and reading, reading, reading. And then I'll get back to training. One thing about having my left arm in a sling (and still with the pain, in spite of alternating between aspirin and acetaminophen every 3 to 6 hours), is that for the first time ever I've been watching the U.S. Open without too much guilt. Still some, but not as much as in the past. So today, rooting for Serena all the way, I watched Roberta Vinci beat her in the semifinal, and I was crushed. Not as much as Serena was, obviously, and what struck me was the courtesy with which she handled the inane questions from the "press" right after the match. Some started off with the usual stupid question: Can you tell us how disappointed you are? Serena gave the perfect reply: "I don't want to answer any questions about how disappointed I feel. If you have any other questions, I'll be able to answer them." And she went on answering for a good 10 minutes longer. Brave woman. It reminded me of a press conference she had to participate in after the quarterfinal. So many questions, so many of them idiotic and undoubtedly maddening to Serena, or anyone. Finally someone asked her why she wasn't smiling. She said (paraphrasing), "Well, it's 12:30 in the morning, and I'm tired, and I have to get up early tomorrow to practice, and you all ask the same questions all the time..."
"Put the ball in the court, and then run. Run. Run." A great philosophy for all of life, not just tennis. 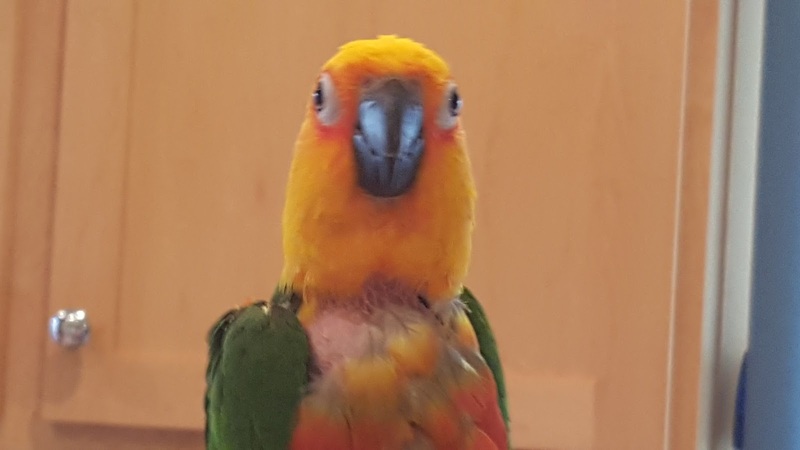 Whoever "owned" Tazzie for most of her life obviously loved this little bird. She knows how to step up onto my hand and "kiss" me on request, knows to talk softly when she's on my shoulder, and knows that when I go into the bathroom with her she can ask for a bath, and asks for a bath every day. I've taken a couple of movies of Tazzie in the bath, splashing around and talking softly; and I'll post then soon. Poor baby is afraid of the other birds, though. We'll keep working on helping her bond with them, especially with Carly. And she still seems to be plucking out feathers. I don't think it's because she's stressed at this point. Maybe it's just like any bad habit we can all develop, which is hard to break even when we don't have the "need" to indulge in it any more. Like overeating, smoking, wasting time with online junk, and so on. So I'm working on helping her have plenty of other things to do besides sitting on her perch and plucking out her feathers. If anyone has any other ideas or suggestions---which could be based on human behavior, not just any knowledge of bird behavior, because they seem to me to be very similar---please let me know.